Carbon-micro or nano silicon carbide–boron carbide (C-micro or nanoSiC–B4C) composites were prepared by heating the mixtures of green coke and carbon black as carbon source, boron carbide and silicon at temperature of 1,400 °C. Green coke reacts with silicon to give micron sized silicon carbide while the reaction between silicon and carbon black gives nano silicon carbide in the resulting carbon–ceramic composites. The green coke was coated with a suitable coal tar pitch material and used to develop carbon-(micro or nano) silicon carbide–boron carbide composites in a separate lot. The composites were characterized for various properties including oxidation resistance. 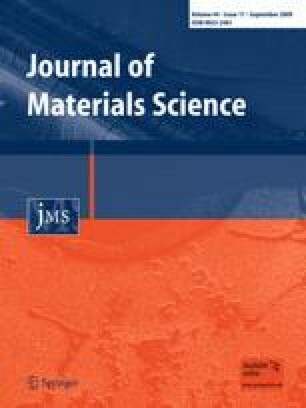 It was observed that both types of composites made from uncoated as well as pitch-coated green coke exhibited good oxidation resistance at 800–1,200 °C. The density and bending strength of composites developed with pitch-coated green coke improved significantly due to the enhanced binding of the constituents by the pitch. The authors are thankful to Dr. Vikram Kumar, Director for his kind permission to publish these results and to Dr. A. K. Gupta for the encouragement throughout the investigation. Thanks are also due to Dr. V. P. S. Awana and Mr. K.·N. Sood for their help in X-ray and SEM measurements, respectively. The authors are also thankful to Department of Science and Technology New Delhi for sanctioning the project on carbon–ceramic composites and also for the grant of project assistanceship to Mr. Rajeev Kumar, Mr. Sandeep Kumar and Mr. Anil Kumar.